14.6" x 21.4" stitched on 14 count. 11.3" x 16.7" stitched on 18 count. 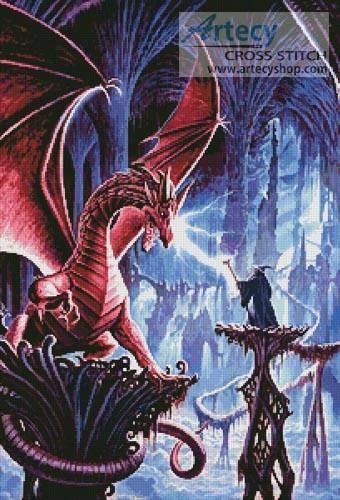 The Dragons Lair cross stitch pattern... This counted cross stitch pattern of a Wizard in a Battle with a Dragon was designed from artwork by Steve Crisp. Original image copyright of Meiklejohn Graphics Licensing (MGL) www.mgl-uk.com. Only full cross stitches are used.